Greg Crist of the National Timeshare Owners Association drew our attention to the following important news happening in our industry. Wyndham Worldwide yesterday announced plans to spin off the company’s hotel business resulting in two separate, publicly traded companies. Wyndham Hotel Group, with headquarters in Parsippany, NJ, will become a new, publicly traded pure-play hotel company with a portfolio of renowned brands. Wyndham Vacation Ownership, with headquarters in Orlando, Florida, will be the world’s largest publicly traded timeshare company and will be joined with Wyndham Destination Network, home to RCI, the world’s largest timeshare exchange company. The Company will also explore strategic alternatives for its European rental brands. The two public companies intend to enter into long-term exclusive license agreements to retain their affiliation with one of the industry’s top rated loyalty programs, Wyndham Rewards, as well as continued collaboration on key inventory sharing and customer cross-sell initiatives. The corporate names of the post-spin public companies have not yet been decided. The transaction is expected to increase the fit and focus and strategic flexibility of the two post-spin companies, allow each company to maintain a sharper focus on its core business and growth opportunities, facilitate future capital raising as needed for the two companies, and position each to be better able to make the changes necessary to respond to developments in its markets. Following the planned separation, both companies will have significant scale and leadership positions within their industries, strong cash flows, rich portfolios of trusted brands, and the existing relationships in place to drive attractive growth and shareholder value. 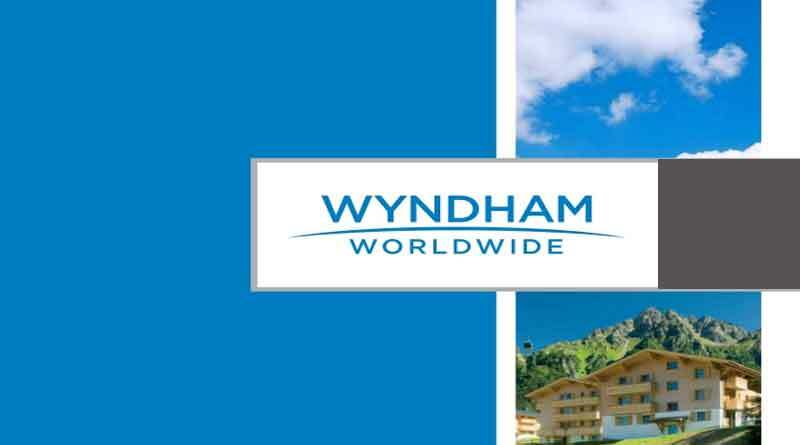 The transaction, which is expected to be tax-free to Wyndham Worldwide and its shareholders, will be effected through a pro rata distribution of the new hotel company’s stock to existing Wyndham Worldwide shareholders. Wyndham Worldwide expects the transaction to be completed in the first half of 2018. As two separate public companies, the vacation ownership company and the hotel company will have separate boards of directors. Holmes will serve as Non-Executive Chairman of the Board of Directors for both companies. Geoff Ballotti, current CEO of Wyndham Hotel Group, will continue to lead the hotel company as President and CEO. With more than 30 years’ experience, Ballotti is well positioned to continue advancing Wyndham’s leadership in the economy and midscale hotel segments, while growing the company’s upscale portfolio and management business. Gail Mandel, CEO of Wyndham Destination Network, will continue to lead that business through this transition, and Tom Conforti, CFO of Wyndham Worldwide, will move into an advisory role, working with the Company through the transaction. David Wyshner will assume the role of Wyndham Worldwide CFO and will become CFO of the hotel company upon spin. Wyshner was most recently President and CFO of Avis Budget Group, the global vehicle rental service provider, and served as Avis Budget’s CFO for more than ten years. Prior to that, Wyshner served as Executive Vice President and Treasurer of Cendant Corporation, a global diversified services company with approximately $20 billion in annual revenues, where Wyshner led the execution of that company’s separation into three publicly traded companies. Michael Hug will serve as CFO of the timeshare company. Hug has been Executive Vice President and CFO of Wyndham Vacation Ownership since 2005. Previously, he served as Senior Vice President and Controller. Prior to joining Wyndham Vacation Ownership, Hug spent 11 years with EY. Wyndham Hotel Group is one of the world’s largest and most diverse hotel businesses, with a global portfolio of 18 brands and over 8,100 hotels – more than any other company in the world – with approximately 705,700 rooms in over 80 countries and 2016 revenues of $1.3 billion. Michael Brown, current CEO of Wyndham Vacation Ownership, will continue to lead the timeshare company as President and CEO. A 25-year industry veteran, Brown was appointed to lead the timeshare business earlier this year, bringing a strong combination of strategic vision, people-centric focus, and industry knowledge. With over $2 billion in gross timeshare sales in 2016, Wyndham Vacation Ownership is the world’s largest developer and marketer of vacation ownership products. Wyndham Vacation Ownership develops and operates a portfolio of over 220 resorts throughout the United States, Canada, Mexico, the Caribbean, South America and the South Pacific, managing vacation ownership sales, marketing, consumer financing operations and property management. RCI is the world’s first and largest vacation exchange network, which introduced trading flexibility to vacation ownership more than 40 years ago. With over 4,300 affiliated properties in more than 100 countries, RCI members can choose from a variety of accommodations and vacation experiences. Wyndham Worldwide will disclose more details of the proposed separation upon the filing of a Form 10 registration statement with the SEC, including financial and other details. The separation is subject to final approval by Wyndham Worldwide’s Board of Directors, execution of intercompany agreements, arrangement of financing facilities, the effectiveness of the registration statement, and other customary conditions. The Company intends to seek a ruling from the Internal Revenue Service with respect to certain aspects of the transaction. The separation will not require a shareholder vote. Wyndham Worldwide expects to complete the separation in the first half of 2018 but there can be no assurance regarding the timing of the separation or that the separation will ultimately occur. Deutsche Bank Securities Inc. and Goldman, Sachs & Co. are acting as financial advisors to the Company, and Kirkland & Ellis LLP is acting as legal advisor. Wyndham Worldwide Corporation will issue its second quarter 2017 earnings release post market on Wednesday, August 2, 2017 and will hold a conference call with investors to discuss today’s news as well as the Company’s second quarter 2017 results, outlook and guidance on Thursday, August 3, 2017 at 8:30 a.m. ET. Listeners can access the webcast live through the Company’s website at http://www.wyndhamworldwide.com/investors/. The conference call may also be accessed by dialing 800-862-9098 and providing the pass code “WYNDHAM.” Listeners are urged to call at least 10 minutes prior to the scheduled start time. An archive of this webcast will be available on the website for approximately 90 days beginning at 12:00 p.m. ET on August 3, 2017. A telephone replay will be available for approximately 10 days beginning at 12:00 p.m. ET on August 3, 2017 at 800-695-2533. This press release contains “forward-looking statements” within the meaning of Section 21E of the Securities Exchange Act of 1934, as amended. Forward-looking statements are those that convey management’s expectations as to the future based on plans, estimates and projections at the time Wyndham Worldwide makes the statements and may be identified by terminology such as “will,” “expect,” believe,” “plan,” “anticipate,” “goal,” “future,” “outlook,” guidance,” “target,” “estimate” and similar expressions. Forward-looking statements involve known and unknown risks, uncertainties and other factors, which may cause the actual results, performance or achievements of Wyndham Worldwide or the post-spin companies to be materially different from any future results, performance or achievements expressed or implied by such forward-looking statements. The forward-looking statements contained in this press release include statements related to the Wyndham Worldwide’s current views and expectations with respect to the spin off and related transactions, as well as the post-spin companies’ future operating, financial and business performance. You are cautioned not to place undue reliance on these forward-looking statements, which speak only as of the date of this press release. Factors that could cause actual results to differ materially from those in the forward-looking statements include general economic conditions, the performance of the financial and credit markets, the economic environment for the hospitality industry, the impact of war, terrorist activity or political strife, operating risks associated with the hotel, vacation exchange and rentals and vacation ownership businesses, uncertainties that may delay or negatively impact the spin off or cause the spin off to not occur at all, uncertainties related to the post-spin companies’ ability to realize the anticipated benefits of the spin off, uncertainties related to Wyndham Worldwide’s ability to successfully complete the spin off on a tax-free basis within the expected time frame or at all, unanticipated developments that delay or otherwise negatively affect the spin off, uncertainties related to Wyndham Worldwide’s ability to obtain financing for the two companies or the terms of such financing, unanticipated developments related to the impact of the spin off on our relationships with our customers, suppliers, employees and others with whom we have relationships, unanticipated developments resulting from possible disruption to our operations resulting from the proposed spin-off, the potential impact of the spin-off and related transactions on Wyndham Worldwide’s credit rating, uncertainties relating to Wyndham Worldwide’s exploration of strategic alternatives for its European rentals brands and the outcome and timing of that process, as well as those factors described in Wyndham Worldwide’s Annual Report on Form 10-K, filed with the SEC on February 17, 2017, and in Wyndham Worldwide’s subsequently filed Quarterly Reports on Form 10-Q and Current Reports on Form 8-K. Except for Wyndham Worldwide’s ongoing obligations to disclose material information under the federal securities laws, it undertakes no obligation to release publicly any revisions to any forward-looking statements, to report events or to report the occurrence of unanticipated events.